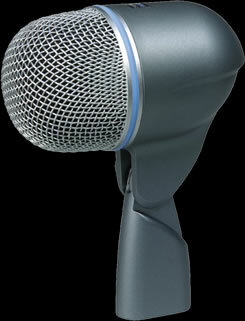 This the latest addition to Dave's arsenal of Shure microphones. After checking them out at the 2017 NAMM show, Dave had to try them out! They're now in Dave's studio and sometimes on his live kit, picking up the sound of Dave's toms. The precision-engineered BETA®181 is a versatile condenser instrument microphone with interchangeable polar pattern capsule options. 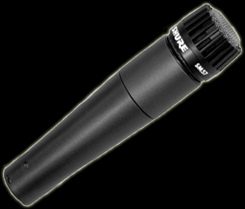 The Shure SM-57 unidirectional dynamic microphone is exceptional for musical instrument pickup or for vocals. It has been Dave's choice for his snare drums ever since he first began miking drums. With its bright, clean sound and carefully contoured presence rise, the SM-57 is ideal for live sound reinforcement and recording. It has an extremely effective cardioid pickup pattern which isolates the main sound source while minimizing background noise. In the studio, it is excellent for recording drums, guitar, and woodwinds. For musical instruments or vocals, the SM-57 is a consistent choice of professional performers. It is also the standard microphone used on the podium of the U.S. President for over 30 years. Its outstanding performance, legendary reliability, and diversity of application make this "workhorse" the choice of performers, producers, and sound engineers the world over. 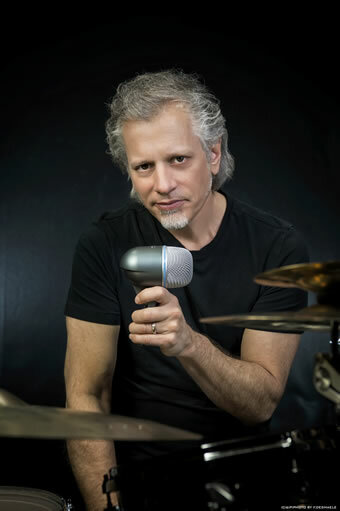 The SM-81 is Dave's go-to mic for his hi-hats! The SM-81 is ruggedly constructed. It operates on phantom power and performs over a wide range of temperatures and humidity conditions. It is furnished with a swivel adapter, attenuator-switch lock, foam windscreen, and case for carrying and storage. Other accessories are available. Clck here to learn more and purchase. 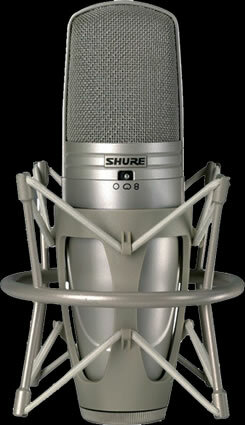 The Shure Beta-52 is a professional quality kick drum mic made for studio and live use. It has a frequency response that has been specifically tuned for kick drums as well as other bass or low frequency instruments (like bass guitar). It has a great sound with excellent attack and frequency response. You can place it right in the kick next to the beater (if you like a lot of click) as it can handle up to 174 dB. The frequency response is 20Hz up to 10kHz. The polar pattern is super-cardioid which is more directional at lower frequencies. 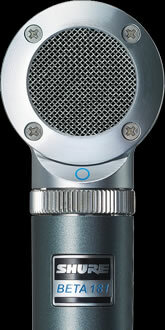 The mic will reject sounds from the rear and sides which makes it work well in the studio and for live situations. 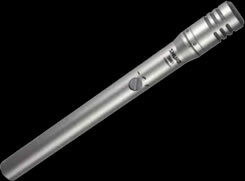 This is a a high output dynamic mic which can take the punishment of being on the road. It is Dave's choice for bass drums of any size. He also uses it for the DG Gregorio cajon (port miking) and underneath the Remo Tombek, producing a great low end sound. Dave still occassionally uses these mics (and the SM98s before them) for live situations, mostly for toms. However, he recently switched over to the new Beta 181s in the studio. TECHNICAL: The Beta 98D/S is a high performance mini-condenser microphone designed to excel at professional sound reinforcement or recording. Its ultra-uniform supercardioid pickup pattern provides high gain before feedback and excellent rejection of unwanted noise. An optional cardioid cartridge lets you easily adapt the mic to different applications. As the successor to the popular SM98A, the Beta 98D/S features several notable improvements. Dynamic range is 4 dB greater, as is headroom, while maximum SPL is 5 dB higher (now 160 dB!). 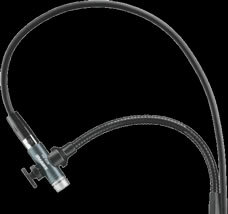 Physically, the mic utilizes a thicker, beefier Triple-Flex® cable (detachable). Because it bears the Shure name, you can be certain that the Beta 98D/S will withstand just about any abuse it may run across and keep delivering great sound. This is Dave's first choice for that open overhead sound, capturing all of the drums and cymbals with a nice bright tone and big overall warmth. Dave's go-to overhead mic for the road, or tighter overhead applications in the studio. Click here to visit the Shure Web site.